Pasta Primavera is the quintessential dish to showcase the beautiful, young produce from the farmers' market or garden, is it not? Though it may be a little outdated (just the name makes me think of those heavy, over-sauced variations that were popular in restaurants in the 80's), I love it anyway. Whatever you call it, Springtime Pasta should always highlight Spring's freshest veggies tossed with some sort of pasta and a light sauce, frequently a béchamel. I always make several variations at the beginning of Summer when the pea plants hang heavy on the garden fence; when the first tender carrots are just barely long enough to be pulled, and the herb box is beginning to overflow in a cascade of colours and flavours. Here in Colorado our Farmers' Markets opened last weekend, and my, how I've missed them! We were traveling, and my first priority upon returning home - before unpacking the suitcases, before laundry - was to seek out the dates and locations of all the markets in town. We have a few new ones this year, and I was very anxious to purchase some produce and eggs from the nearby farm I told you about a few weeks ago. E and I spent yesterday afternoon at a new Farm and Art Market held in the sculpture garden of one of our fine art museums. What a treat! E was enthralled by the giant statues all around her. I by the tables full of crisp green and purple lettuces and kale, plump crimson beets and snowy turnips, sugary garden-fresh peas, and crates upon crates of rosy red cherries. There were vendors selling Wildflower Mead, and a local German baker who assured me that the entire bakery was peanut-free. (There's no safer way to shop for someone with food allergies than from local artisans who know their products inside and out.) I bought a spectacular Rye baguette from her, and made a steaming pot of Turkey, Kale, and Quinoa Soup to go with it. The kids devoured the cherries as soon as possible, and I had to limit them to two colourful carrots each, just so there'd be enough for the pasta later that evening. I can't think of a better way to get kids to eat their veggies. This is one of my favourite variations of Pasta Primavera. It's light and refreshing, sauced only in Brown Butter, and complemented by fresh lemon, sage, and parsley. The sweet, young veggies are just slightly cooked and remain crisp and fresh. Sitting on the shaded patio, with a glass of cool Pinot Grigio and a plate of this pasta, I feel as if Summer has finally arrived. Season the chicken well with salt and pepper, and grill until cooked through (I do this on the indoor grill). Meanwhile, bring a large sauce pan of salted water to a boil. Add the pasta and peas and cook 5-6 minutes, until al dente. Drain and place in a large serving bowl. Heat a large skillet over medium-low heat. Add 2 tsp olive oil and saute the zucchini, carrots, onion, and garlic slowly, with a good pinch of salt and pepper. Stir occasionally until the zucchini is cooked through and the carrots are tender-crisp, about 15 minutes. Melt the slices of butter in a sauce pan (I use the same pan in which I cooked the pasta) over medium heat. Swirl and whisk the butter as it melts so it cooks evenly. Watch it very carefully. As soon as it starts to turn brown and smell nutty remove the pan from the heat and whisk in 1 tsp of lemon juice and a pinch of salt. Be careful; it will foam like crazy. Immediately pour the sauce over the spaghetti, add the chopped herbs and the zest of 1/2 the lemon. Toss to coat. 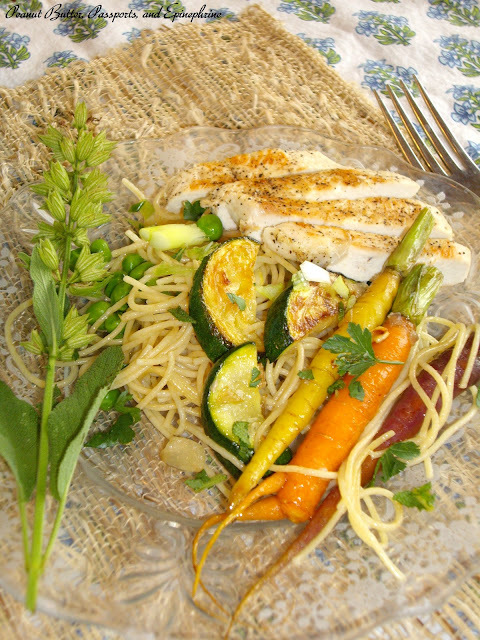 Place the vegetables on top of the pasta and top with the sliced grilled chicken. Looks really tasty! Those carrots in particular look so good, love all of the different colors! What a beautiful and tasty dish. Your carrots are beautiful. I can't wait to try this dish it looks delicious. Hope you are having a great week end and thank you so much for sharing on Full Plate Thursday. This looks amazing! I love how colorful this dish is. 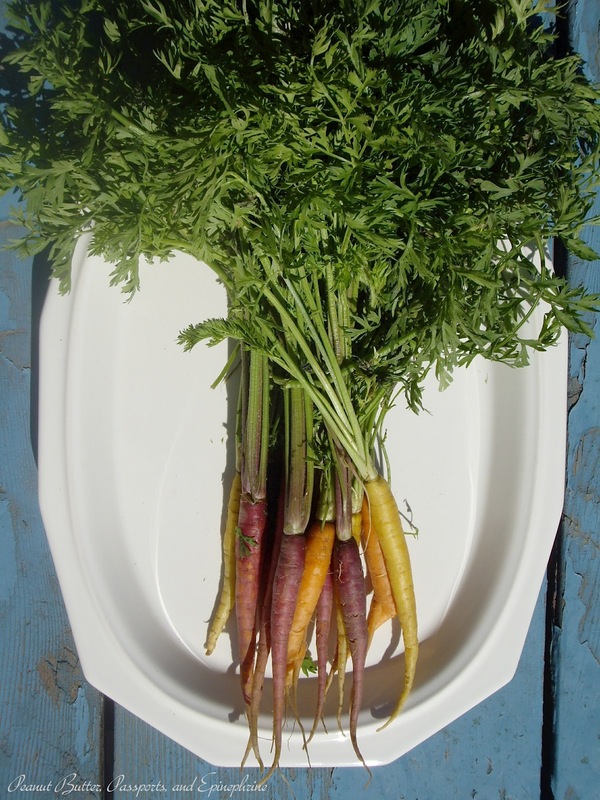 I enjoy growing vegetables of different colors and have grown red, white and purple carrots. The kids always enjoy them. I love how you used your farmer's market finds... a beautiful and healthy meal. Thanks for sharing it on foodie friday. I love my Farmer's Market; there are always so many wonderful things there. Your market sounds fantastic too. 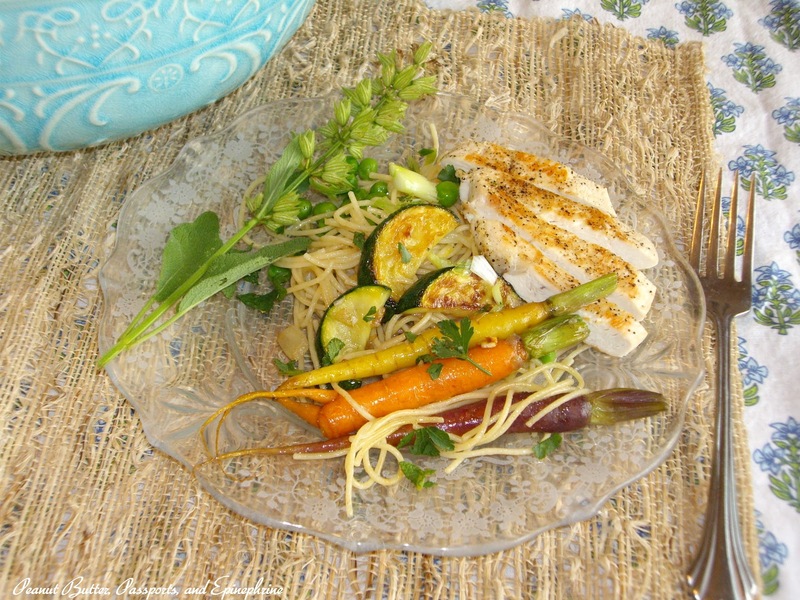 Your pasta primavera recipe is so lovely with all the colourful vegetables. It all looks and sounds so appetising, especially with the browned butter!